Tender chicken marinated with a garlic and herb marinate cooked with vegetables of your choice. Pre-cooking some of the vegetables, especially potatoes and carrots, will help to keep the chicken from getting over cooking while getting these tender. Place the marinade in a zipper lock bag. Add the chicken, seal and refrigerate for several hours. 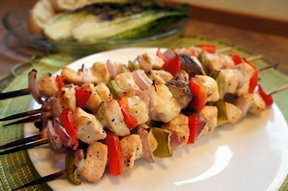 Alternate the veggies and chicken on the skewers. 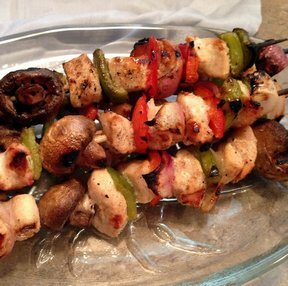 Take the filled skewers and place on the grill. 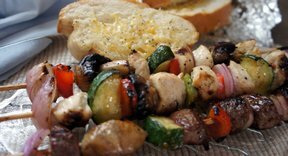 Use the reserved marinade to baste the meat and veggies on the on the grill. NOTE: Boil the marinade mixture for several minutes before using it to baste. 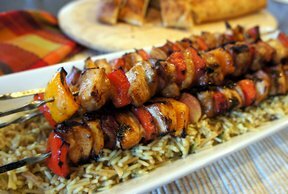 If you are using bamboo skewers, soak them for several hours in water so they won't burn on the grill. "Perfect for the lake. These had great flavor. I also marinated the vegetables in Italian dressing and it was perfect. I used onions, peppers and mushrooms."